How about this for a holiday cottage which is a little different? "The Water Tower" was a water tower, built in the Victorian period, and recently converted to be this holiday cottage. 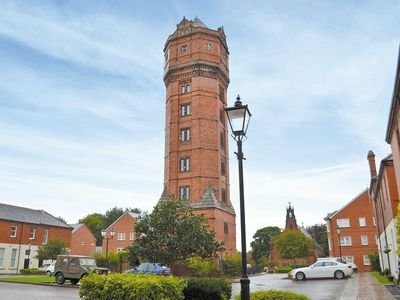 The Water Tower now sleeps 11 people - so is a good place for friends and family to get together and stay in a holiday cottage with a difference. There are 8 floors at The Water Tower, with the top floor offering 360° views out across the landscape. And the bedrooms being interspersed throughout the property. There are 5 bedrooms at The Water Tower - 4 double bedrooms and a twin bedroom. Additional sleeping for one other person is available in a pull-out bed in one of the double bedrooms, so The Water Tower sleeps 11 people. If you've got a dog which wishes to holiday with you, you'll be pleased to hear that The Water Tower is pet friendly too. The 7th floor boasts a games room complete with snooker table. There are four TVs, DVD players, a CD player and an iPod dock. A Bang and Oulfsen music system is installed and can be played in several rooms. You get Wi-Fi at The Water Tower too. A washing machine, tumble dryer and dish washer are all available. An enclosed garden offers you somewhere to sit on a summer day; with The Water Tower sitting in 137 acres of shared grounds. Around the area you have the Peak District National Park, which offers a variety of walks, cycle rides, and horse riding. Or head to Rudyard Lake and Tittesworth Reservoir for some water sport action. The Churnet Valley Steam Railway is a couple of miles away; and you might wish to visit Alton Towers, which is a 12 mile drive. The nearest shop to The Water Tower is a mile away; with the pub and restaurant being ½ mile away. Should The Water Tower not be to your liking, but you fancy staying in the area around Leek, you might well be interested in the cottages below. All these cottages are within a few miles of The Water Tower.